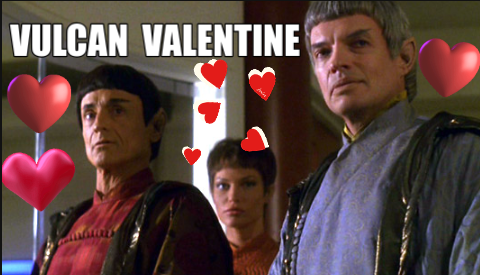 Vulcan fans, prepare yourselves for a heartwarming embrace. You’ll soon be embarking on a most logical layover. Your favorite alien race is sending our entire galaxy a heartfelt Valentine. Huh? Wait a subspace spanning minute here. Aren’t those guys unemotional? Are we talking Valentine’s Day or is it suddenly April Fools? Vulcans are well known for utilizing their searing, unforgiving logic. They want us to all simply Live Long and Prosper, right? They’re not so famous for behaving overly lovey dovey. Apparently, with news of this intensely loving move, they now seek to forever change their aloof reputation. Considering it’s one big news reporting galaxy, Laugh Trek feels especially honored. We became the first Federation outlet to see the romantic overture coming from Spock’s people. Let’s face it. Humans are romantic softies. Earth remains a planet full of old fashioned romance. No matter our modern society, we as humans still are big suckers for the traditional notion of romance stories. But can it really be true? Vulcan deeply in love with the galaxy? As Spock so often says, ‘Fascinating.’ We questioned the Vulcan High Council about it all, and it was all they could do to hide their affection.